A file system is an essential element in any computing system. This is what would determine how you save your data and retrieve it. We have access to numerous file systems currently being used on production devices. Some of the popular file systems usually being used today include exFAT, F2FS, and ext4 to name a few. However, there have been newer developments in this technology, and we thought of exploring two of the most emerging storage options that have become quite popular over the past couple of years – EROFS vs Squashfs. While both of these filesystems are designed by different companies, they have their similarities. They are designed for tiny Android/Linux based devices which perform smaller computational tasks and does not require a full sized Kernal OS or storage specifications. While they are small, they are highly optimized to offer good performance and fewer bottlenecks. EROFS is a new file system developed by Huawei for open source Linux file system. It stands for Extendable Read-Only File System. Of course, the file system is still under development. What makes it stand apart from the rest of the file systems currently in use is the fact that it offers you an improved file level compression. The new file system is more focussed on improved performance and speed. The engineers in charge of the development of the file system have been stating that EROFS will provide a better performance and disk speeds (IOPS) compared to the current breed of read-only file systems. The numbers reported have been impressive enough, but still, not much information is available as the file system is still under development. The still-in-progress file system has been planned to be made available on Android devices. However, it may take a lot of time until Huawei may consider including the file system in the mainstream Linux kernels. The new file system is designed for use on the devices that come with very limited physical memory and lots of memory requirements. One classic example of this type of scenario is an Android device. Another device category that may need this type of high compression storage option is an embedded device. Finally, the system is being developed and is at the staging phase as of now. You may not find it on the Android devices any time soon. It may take months or even years to reach that stage. It all depends upon the adoption rates with the developers to make it a reality. In a tiny sized Linux system, each byte of the storage becomes all critical requirement. That would perhaps explain why you find a higher degree of compression being employed in the Linux systems for everything. And that includes file systems as well. SQUASHFS is the right step in that direction. The file system lets you compress the entire file system and even the directories. You can use them to write them to other devices or other partitions. The file system comes with a modular design and thus a blessing in disguise for the systems that have limited resources. In essence, the SQUASHFS system should be one of the best options for adding flexibility and a performance boost. It has the data, inodes, and directories compressed, thus saving space. It uses the block sizes that range up to 64 Kb (2.x) and 1Mb (3.x). The file system can detect duplication of files and remove them. One of the features that should make it more advanced and efficient can be the higher compression ratios that offer better results than the previous versions like JFFS2 or CRAMFS. The file system had been outside the realm of mainline kernel since long and has been made part of it with the release of the version kernel 2.6.29. The application areas that a SquashFS system can support could be manifold. This has been under development for several years. The system is a read-only memory and was specifically started development with a focus on the embedded systems. It has been considered to be one of the most feature rich file systems to date. The size of the file system and the size of the files and directories as offered by SquashFS are indeed appealing. Well, it may be too early to make comments on the features and functions available, leave alone making any comparison between EROFS and any other file system. That is only because the EROFS file system is still under development and it can take even years to find the reliable results and implementation of the system in our day to day tasks. Another possibility cannot be overthrown either. You may not be able to assure that the file system will be made available for the mainstream needs. You would need to wait till Huawei decides to include the new file system into the mainline Linux kernel. If you are looking to the inclusion of the system into the consumer Android devices, it may take more than a few years. We will take this development with a pinch of salt as of now. We have seen developers coming up with their experimentations and then abandoning them off altogether. Samsung’s testing with the F2FS system can be a good case in point. We would not be surprised to see that the EROFS not at all making it to the actual Android adoption. However, you can keep yourself abreast with the development of the file system by checking out the real progress at this link. 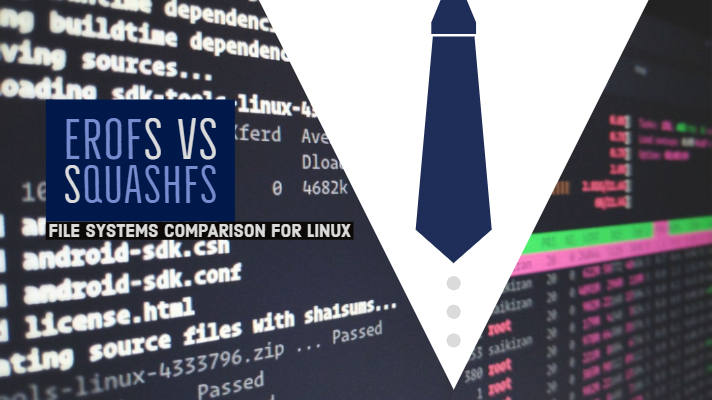 That was all we have with respect to the comparison between the EROFS vs SQUASHFS file systems. Since the EROFS file systems are yet to be launched, the developers are not coming up with any reliable information about the system. We may need to wait for a little longer until further development takes place with the system. Until that happens, the SquashFS file system will continue to be one of the prominent Linux based file systems under dev.